I thought I'd share a little bit about the thought that goes into our programming. After all, there must be something a little unique about the station..otherwise, its existence would be pointless. When I first began the stream in 2001, the content was all-Christian. And it worked, for a time. But it seemed like it was getting harder and harder to obtain the music I needed in order to stay somewhat current. By mid-2003 I had plenty of classic Christian music. The currents were hit-or-miss, so I blended positive country with contemporary Christian (as did a station in Greenville, SC) around that time. A lightning strike damaged the station in the spring of 2005. That, combined with some family "stuff" led me to relegate the station back to "hobby" status that year. At that time, the station was flipped to country, with some currents mixed in, but with the majority of the tunes being classic country. 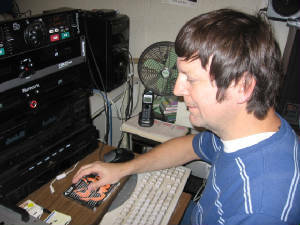 In 2006, I brought back the MUSIC OF NEW LIFE, first as a weekly program, then as a full-time second station. The second station received donations for start-up and three months of operation. But classic Christian never caught on and after losing money with it for six months in a row, I signed it off permanantly in November 2006. I repackaged the MUSIC OF NEW LIFE format as a weekly two-hour show and put it on the country station. In June of 2008 I brought back the positive country somewhat with "Radio for Faith, Family and Country." It generated some buzz, but I found that the burn-out factor of having so few titles to work with under that label was hurting us. It was short-loved, and I then added some oldies to the mix. I called it "The All American." That led to a few emails - some positive, some negative - about the station's programming. Plus, the name was too vague - nobody could tell from the name of the station what the format was. Oops. I began doing some serious soul-searching in early 2010 about what direction the station should take. If I couldn't resolve it, I decided, I would call it quits and pull the plug on it for good. I had noticed a bit of a format fight going on in the radio world - stations either played "today's hot country" OR they played "classic country." There wasn't much merging of the two. In June of 2010 I started phasing out the oldies in favor of country. I left the classic country in, but added all the current Top 40 songs to it. The record companies, some radio friends, and others seemed to jump on it. For the first time ever, I actually had every current song available for airplay. On November 4, 2010, at 6:00 AM Eastern Time, "Big D Country" was launched in its current format - today's top country hits and the legends. I am absolutely loving this format and think I probably should have taken this route and run with it years ago. It feels like coming home to me. "Big D Country" has it all - current Top 40 country, positive country, classic country, and even continues the MUSIC OF NEW LIFE broadcast on Sunday mornings. In a future post, I'll discuss a little more about the music clock - and why this is not just about throwing some songs on a computer and letting it roll unattended. There really is a method to the madness. "Great station! Love listening to it while working." "Please don't ever go away - so glad I found this station." 'I like the variety of not hearing the same 17 songs repeated every other hour." Me, too. That's why listeners like us - we ARE different, just not TOO much!